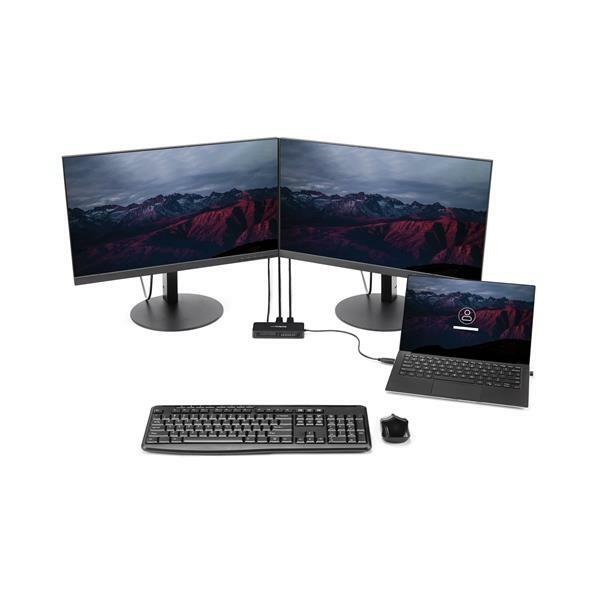 This USB to Dual DisplayPort Mini Dock provides your USB 3.0 laptop with connectivity for dual 4K 60 Hz monitors and Gigabit LAN - enabling you to quickly harness dual-display productivity and network connectivity. The dual DisplayPort adapter adds two DP video outputs to your USB laptop, with resolution support up to 4K. Working on two monitors increases your productivity by giving you more screen space. You can simultaneously access multiple applications and reference material on one display while composing on the other. Ethernet ports on modern laptops are uncommon, and wireless networks are less secure and less reliable than a hardwired connection. 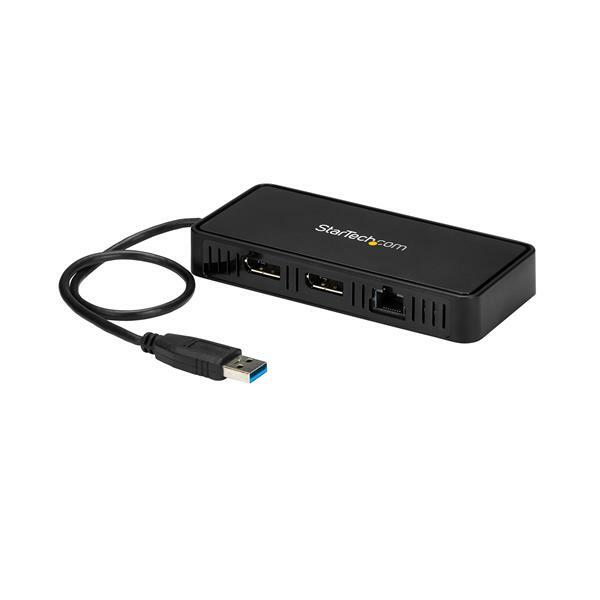 With the GbE port on this portable docking station that features an Ethernet adapter you can access wired LANs even if your USB 3.0 laptop doesn’t have an Ethernet port. 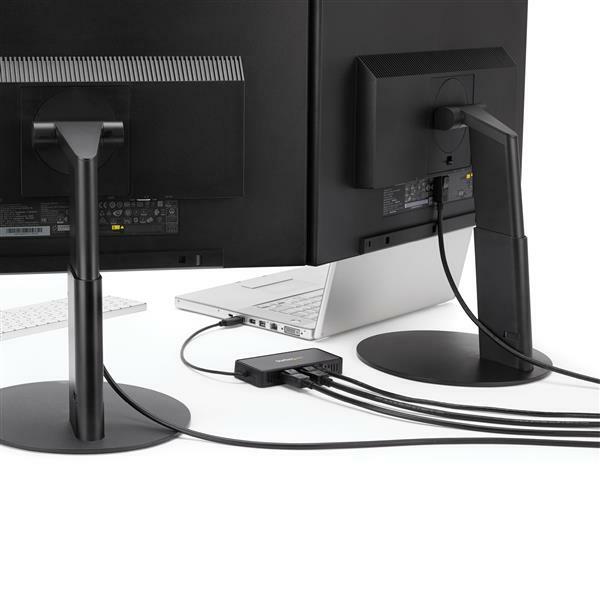 The dock features a compact design that's perfect for business professionals who need portable office desk accessories for traveling between multiple office locations, or shared workspaces. The USBA2DPGB is TAA compliant and backed by a 3-year StarTech.com warranty and free lifetime technical support. 4K resolution is supported on both video ports. A 4K-capable DisplayPort display is required to achieve 4Kx2K resolution. System and Cable Requirements A host laptop with an available USB-A port. (5 stars) Great for the road warrior! 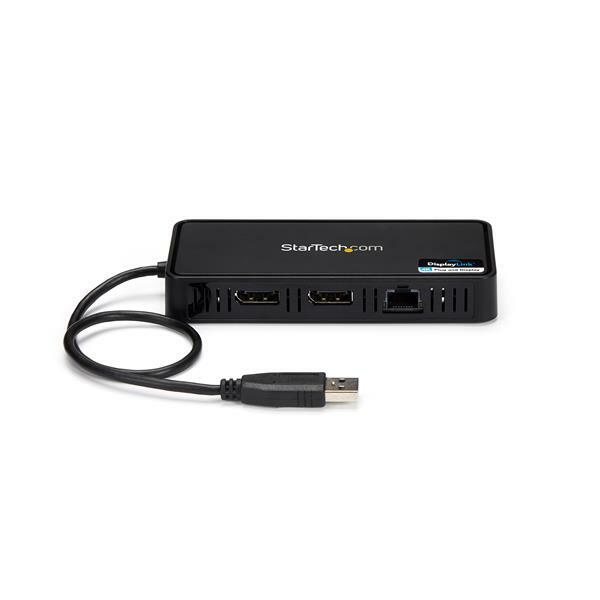 If travelling to different sites this mini dock works well to use dual displayport along with a GB network port. What would be nice is if there were extra usb ports but I am not sure if this would add to the size or if the USB 3.1 port could power it all. I received this product in exchange for an unbiased review. If you are looking for a simple to use usb dock for video this is a really great product. I found the setup of this to be very easy with a plug in and it prompted the install. No issues getting this going at all. The video display quality appeared excellent. I did find that on one occasion that after a reboot it did not detect right away but with a fast disconnect and re plug in it was working again. The build of this dock is good and it has a decent weight to try and keep cable movement down. 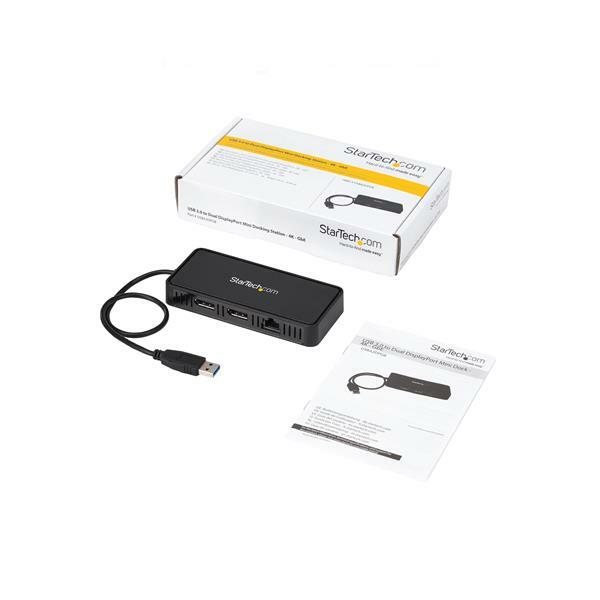 Overall I would say this is a great product for someone who wants to add monitors via usb. I received this product in exchange for an unbiased review. (4 stars) Easy to use dual display port solution! My current three monitor setup fully utilizes my laptop and dock available display ports. This solution allows me to add those much needed additional displays. The fact that it supports 4K when my existing dock does not is an added bonus. Additionally, being bus-powered eliminates the need to carry around yet another bulky power adapter. Disclaimer: I received this product in exchange for an unbiased review. Plug and play and worked exactly as it should. I do not have 4k monitors but I did try a 1440p monitor and a 1080p monitor and both worked great. The added ethernet port is a bonus. This is ideal for someone who wants to extend their laptop into a workstation with ethernet and dual monitors. I received this product in exchange for an unbiased review. Nice for the those who travel with their laptop. Its compact, light weight, and easy to setup. Needed a little tweaking in windows.